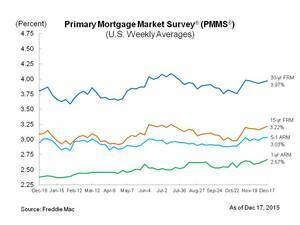 MCLEAN, VA--(Marketwired - Dec 17, 2015) - Freddie Mac (OTCQB: FMCC) today released the results of its Primary Mortgage Market Survey® (PMMS®), showing fixed mortgage rates ticking slightly higher for the second week in a row amid the Federal Reserve's decision to raise short-term interest rates for the first time since 2006. "As was almost-universally expected, the Federal Open Market Committee (FOMC) of the Federal Reserve elected this week to raise short-term interest rates for the first time since 2006. We take the Fed at its word that monetary tightening in 2016 will be gradual, and we expect only a modest increase in longer-term rates. Mortgage rates will tick higher but remain at historically low levels in 2016. Home sales will remain strong, but refinance activity should cool somewhat. Novel policy approaches such as quantitative easing injected significant liquidity in the economy over the past seven years. As a result, the Fed is forced to employ some new tools, such as reverse repos, as it tightens monetary policy. We are likely to see some short-term volatility in fixed-income markets as market participants adjust to these new tools."